Dubai CommerCity, the joint project between the Dubai Airport Freezone Authority (DAFZA) and wasl Asset Management Group, announced the launch of the ‘MENASA e-commerce landscape report (B2C Products Edition). The report assists global companies and startups in evaluating the opportunities within the regional e-commerce market and highlights the high growth in the MENASA region. The report, which will be issued annually in Arabic and English, provides a comprehensive and global overview of the e-commerce sector alongside the role of technology and how it will shape this sector over the next 20 years. The report offers a regional view on 22 countries of the opportunities available in this sector, current and future trends, and the expected developments over the next ten years. The report sheds light on factors that have strategic impact on the region’s e-commerce, including free zones and the logistics sector. The report, which can be downloaded online through DAFZA’s website, represents a road map for international companies, entrepreneurs, and investors and show expectations around future growth levels in light of the initiatives and projects launched. The report reflects investment opportunities and prospects, emphasizing Dubai’s role as a regional center for e-commerce. The report estimates that there was $51 billion of e-commerce sales across MENASA in 2017. While this accounts for only 3% of the global e-commerce sales, the regions e-commerce sector is growing aggressively at 24.6% CAGR growth through to 2020. This is faster than any region in the world, as the global projected growth during the same period is at 20.6% with a declining growth trajectory. According to the report, South Asia represents the biggest market in size, GCC represents the fastest growing and highest spending market in the region. India stands out as the biggest, most mature e-commerce market with $39 billion in estimated e-commerce sales in 2017. The UAE represents the biggest spending per online shoppers at $1,648 with the third highest growth projected through 2020 at 29.6%. Overall retail sales (offline and online) across MENASA represent 12% of overall global retail sales, while e-commerce penetration within global activity is only 3%. This represents a big opportunity for the region to step up to reach e-commerce activity at global levels. This opportunity is further reflected by the fact that in 2017, an estimated 16% of MENASA internet users, approximately 115 million people, were online shoppers. This is a big gap compared to 40% of global internet users who are e-shoppers. This is despite the fact that mobile internet usage in parts of the region is amongst the highest in the world (96% in UAE, 88% Saudi Arabia). The e-commerce sector in the Middle East, North Africa, and South Asia is witnessing considerable growth. This has been led by consumer trends and the development of infrastructure, both in terms of modern technology such as AI, the Internet of things (IoT), and e-payment, and in terms of services, logistics, and shipping. The report presents a global and regional overview of this sector, evaluating its growth and future opportunities, taking future trends into consideration alongside the ongoing technological advancements that promote this growth. It will guide government entities and industry bodies in the region to drive key structural improvements to facilitate e-commerce success for the benefit of the region and other markets. The report highlights five key challenges that can be attributed to limited e-commerce penetration when compared to the rest of the world. These include a lack of consumer awareness, limited payment solutions / behavior, logistic challenges, customs duties and taxation and limited product coverage. Given the key issues that are limiting the growth of e-commerce across MENASA, the report identified six government and industry level strategic considerations to address. These include e-commerce policies enhancement around customs duties, taxation and consumer protection, addressing consumer awareness, consumer trust building, local economy protection, dedicated e-commerce zone and engagement with financial institutions. The report also presents a first ever listing of Top 100 B2C e-commerce companies of MENASA region. Out of the top 100 list, 76 companies are based in MENASA region which is a very healthy sign of local e-commerce development. Turkey has the most e-commerce companies on the list with 24 companies represented, followed by US 14, India 12 and UAE 11. Multi-product market-place sites represent the highest number of companies on the list at 26, followed by 17 in consumer electronics, 13 in fashion, and eight single retailer sites, seven product deals, and seven bookstores. The UAE companies include Souq, Awok, Sharaf DG, Noon, Namshi, Maxfashion, Lulu Webstore, Centre Point, Jumbo, VIP brands and Our Shopee. In addition, the report includes a reference of growth indicators to help companies of various types evaluate available opportunities and bolster their regional presence in this sector. It further outlines the criteria for success in the region based on case studies of selected companies. The report showcases Dubai Commercity’s position as a global hub for e-commerce. It sheds light on the strategic importance of the UAE and Dubai in promoting e-commerce in the region and in facilitating operations, as well as the vital role of free zones in this sector. 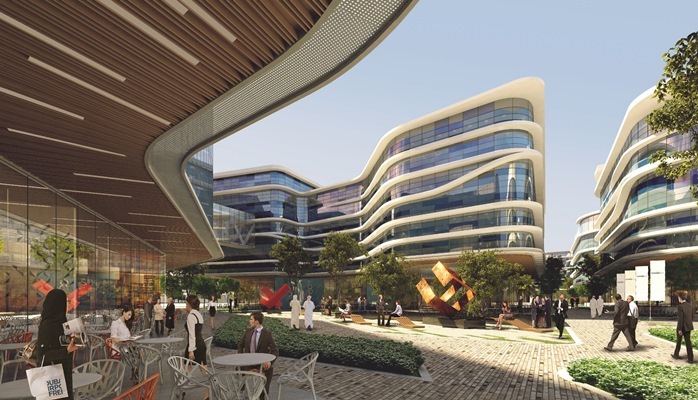 In order to meet the expected growth within the e-commerce sector in the region, Dubai CommerCity is being developed in Dubai’s Umm Ramool area, which represents 2.1-million square feet at a cost of AED 2.7 billion. Dubai CommerCity will strengthen Dubai’s presence as a main center of global e-commerce, establishing zones that support economic diversification and smart transformation, through attracting direct foreign investments in the sector. DAFZA had recently announced increasing the investment value in Dubai CommerCity by 18.5%, to around AED 3.2 billion, as it is based on a unique operating system combined with the attractive investment benefits provided within the free zone. The high-tech features allow clients to establish and launch their businesses in the free zone efficiently and quickly. It also has logistical features that suit the needs of e-commerce companies and enhance their operating experience, namely in terms of its excellent infrastructure, proximity to Dubai International Airport and main UAE roads, making it easily accessible by land, air and sea ports.